"Crafts, Drafts & Facts," a casual, fun educational series featuring local natural resources and environment experts, tasty beverages from local businesses, and the best of all, craft activities! 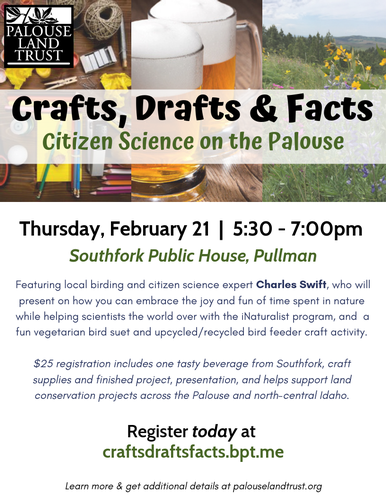 Our inaugural event will be held Thursday, February 21 at Pullman's Southfork Public House beginning at 5:30pm. Charles Swift will present on the iNaturalist program, citizen science opportunities in our region, and some of his favorite local birding spots. We'll be crafting up upcycled/recycled birdfeeders and making vegetarian suet for our feathered friends. 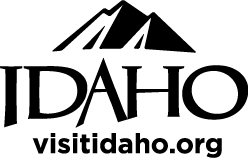 This event is perfect for anyone looking to deepen their connection to the local landscape, learn about our amazing region, and have a little fun in the process. Registration is $25 and includes presentation, a tasty beverage from Southfork, and all craft materials and finished project. Future events will be held at other local businesses and focus on outdoor recreation, native plants and pollinators, birds of prey, local agriculture, and forestry, just to name a few.